The two-day “legal tampering” window is now officially open in the NFL, which means that free-agent speculation should soon turn to actual substance. We'll have the latest updates here. The two-day “legal tampering” window in the NFL opened Monday. That means speculation is turning to actual substance, as deals begin to leak out in advance of Wednesday — when teams can officially announce deals for outside free agents. 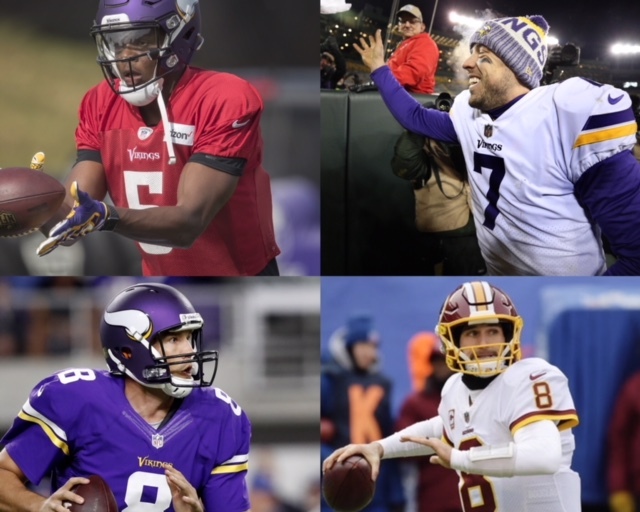 With the understanding that the Vikings’ QB decision — and specifically where Kirk Cousins is going to wind up — is dominating the hearts and minds of tons of Vikings fans, I’m going to attempt to round up all the pertinent information as we know it right now. I’ll also circle back and keep updating this post throughout the next couple of days. *The chatter continues to be that the Vikings are the front-runners for Cousins. There are some early reports suggesting Cousins-to-Minnesota is a done deal and that it will become official Wednesday. The Star Tribune’s Ben Goessling is reporting that Cousins will visit the Vikings. NFL Network’s Ian Rapoport, who has been very busy reporting on a lot of different moves, tweeted Tuesday that the Vikings have offered Cousins a three-year deal at $28 million per season and that Cousins is visiting the Vikings. “It is not over. But if the visit goes well, he is likely to sign there,” Rapoport said. *That comes on the heels of two significant QBs coming off the board. First, Case Keenum — who quarterbacked the Vikings for most of their 13-3 season a year ago with a breakout performance — is slated to sign with Denver once free agency officially begins Wednesday. It had been rumored that Denver was a likely landing spot for Keenum because Gary Kubiak, who coached Keenum in Houston, is now with the Broncos’ personnel department. Second, while it sounds like the Vikings reached out to Saints QB Drew Brees on Monday after New Orleans allowed him to get to the tampering period without a new deal, Rapoport tweeted Tuesday that the Saints and Brees have agreed on a two-year deal for $50 million (more than half of which is guaranteed). *Quarterback was clearly the Vikings’ top position of need entering free agency. Our own Andrew Krammer broke down nicely and concisely where things stand entering free agency with both outside targets and internal candidates. Cousins will command a lot of money — and it’s debatable whether he’s worth it, as our Mark Craig points out here — but our own Ben Goessling also writes that the Vikings are in the strong position of coming off a strong season while also being able to fit Cousins under their salary cap without blowing up the rest of their roster. *Where does this all leave the Vikings’ in-house free agents? Well, Teddy Bridgewater appears to be headed tothe Jets, while Sam Bradford is reportedly heading to the Cardinals. *Cousins isn’t saying a whole lot to tip his hand, but he did publish a blog post on his web site Monday thanking Washington for his six years there and making it official that he is moving on from that team. Goessling noted on Twitter that Cousins (or whomever runs his site) originally tagged “Vikings” and “Jets” in his farewell post.